Hours: Wave Farm is open by appointment year-round. Click for Property Map and Video Tours. 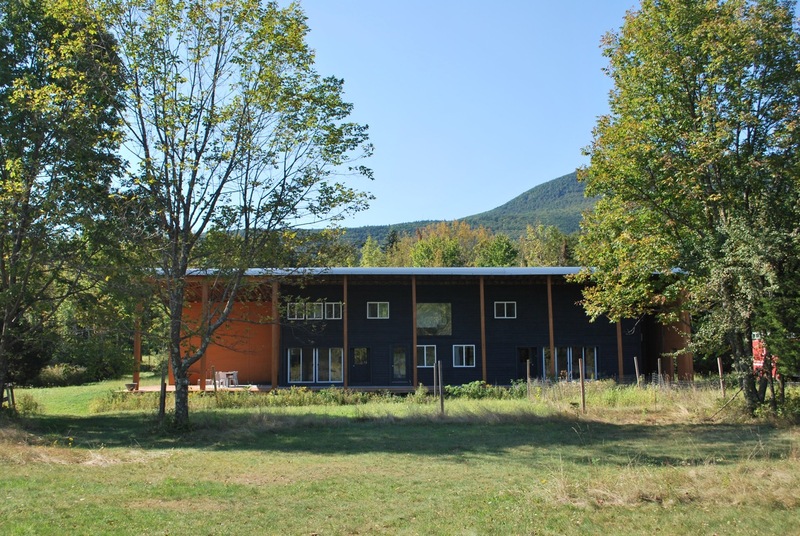 Our organizational headquarters, the Wave Farm Study Center (Acra, NY) is home to an artist residency program, research library, site-specific installations by collaborating artists, Standing Wave Radio 1620-AM and WGXC 90.7-FM's Acra Studio. From the New York State Thruway (I-87): Take Exit 21 (Catskill/Cairo). Turn left at the stoplight after the toll booth. Follow ramp right toward Cairo. Continue on Route 23 West for approximately 12 minutes. (Or... From the Rip Van Winkle Bridge: Heading west, cross the bridge, and continue on Route 23 West for approximately 15 minutes.) When the road forks with 145, bear left (toward Windham) continuing on Route 23 West. Go straight through the stop sign following the fork. From the stop sign, Wave Farm's entrance is 3.6 miles on the right. The entrance is a black top driveway (across from a bright blue house); you will see a rust colored wooden wall with a Wave Farm sign (as pictured). Shortly after turning in, turn right down a stone driveway which leads to the Study Center. Hours: The studio is open to the public Monday - Friday, 11 a.m. - 6 p.m.
WGXC Hudson is the main studio for Wave Farm's WGXC 90.7-FM. 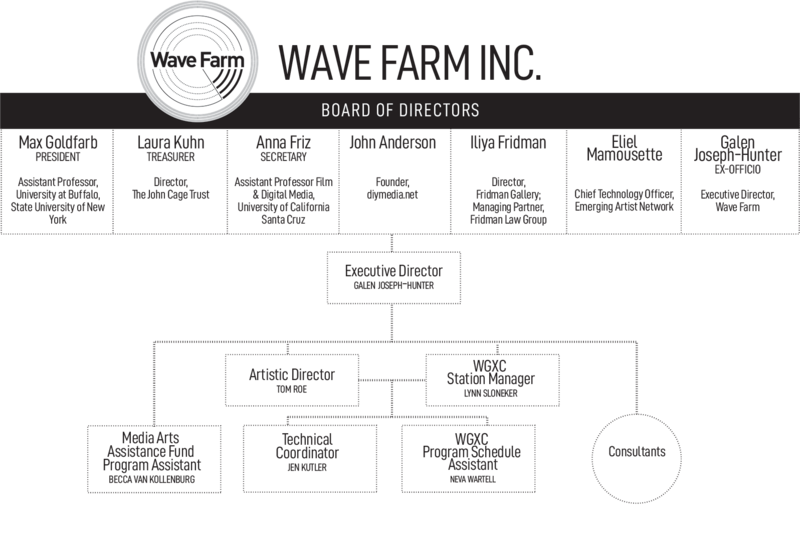 Wave Farm would also like to acknowledge: valuable strategic planning assistance from Doug Sauer and the New York Council of Non-Profits (NYCON); significant pro bono legal counsel from the firms of Sidley & Austin, Proskauer, and Kramer Levin; and extraordinary in-kind site development by Sean Fern from 2004 to 2017. The WGXC Community Advisory Council is comprised of volunteers that serve on WGXC's Volunteer Advisory Committees. Management strives for the Community Advisory Council to reflect the diversity of potential listeners served within the WGXC 90.7-FM listening area. Members offer a representative voice of the community and provide active participation on at least one, and no more than two, of the Volunteer Advisory Committees of Fundraising, Outreach, Programming, and Policy. Wave Farm began in March 1997, as a microcasting collective in Brooklyn, NY called free103point9. free103point9 was an active participant in the U.S. microradio movement, an activist and advocacy effort that helped create this country’s low-power FM radio service, which provides a licensing opportunity for small broadcasters operating transmitters of 100 watts or less. From 1997 to 2004 free103point9 ran a venue for performance and experimental sound in South Williamsburg, Brooklyn. The “free103point9 Project Space” was home to a lively roster of artists working in noise, free jazz, electronic composition, and other experimental fringe genres. Many of these artists encountered microradio for the first time through free103point9. As a result, a local and international community of artists started to think conceptually about the transmission spectrum as a creative medium, becoming invested in a “hands-on” relationship with the airwaves. free103point9 launched an online radio station in 2001 engaging new and international audiences, and embarked on a series of radio experiments, projects, and performances internationally. That airwaves are public space and should therefore be accessible by the public, and that airwaves should be available for creative purposes, experimentation, and risk-taking is the ideology that has driven free103point9’s activities since its inception. In 2002-2003 free103point9 incorporated and secured 501(c)3 non-profit status, evolving from an artist collective to an arts organization whose mission is to define and cultivate Transmission Arts. In 2005, free103point9 expanded activities to Greene County, launching an artist-residency program, outdoor performance series, and installation park on a 30-acre property called Wave Farm. In 2006, free103point9 broke ground on a dedicated facility called the Wave Farm Study Center. free103point9 submitted an application to the FCC in October 2007 during a rare filing window for full-power non-commercial educational FM radio stations. A year later, on October 17, 2008, free103point9 received a construction permit to build a new FM station. The FM station was planned to serve both sides of the organization's roots: radio art and activism on the airwaves. In June 2008, a Council of local advisors was established to guide the development of the station with regards to serving Greene and Columbia counties’ local community. Council members provided critical input in naming the station, identifying its guiding values, and getting 90.7-FM off the ground and on the airwaves. In Fiscal Year 2009, free103point9 became a regrant partner of the New York State Council on the Arts, Electronic Media and Film Program, administering the distribution of grant funds, ranging from 500 to 10,000, to dozens of New York State individual artists and organizations annually. In September 2010, WGXC partnered with the national radio advocacy organization Prometheus Radio Project to host a first full-power FM barnraising in Hudson. The conference included three days of hands-on workshops, presentations, and performances, during which participants collaborated to build WGXC’s Hudson studio and help prepare the station for its FM signal launch. On February 26, 2011, WGXC went live on air at 90.7-FM. WGXC celebrated this momentous occasion with a live broadcast event at the Catskill Community Center, which featured many of the station’s first on-air programmers. 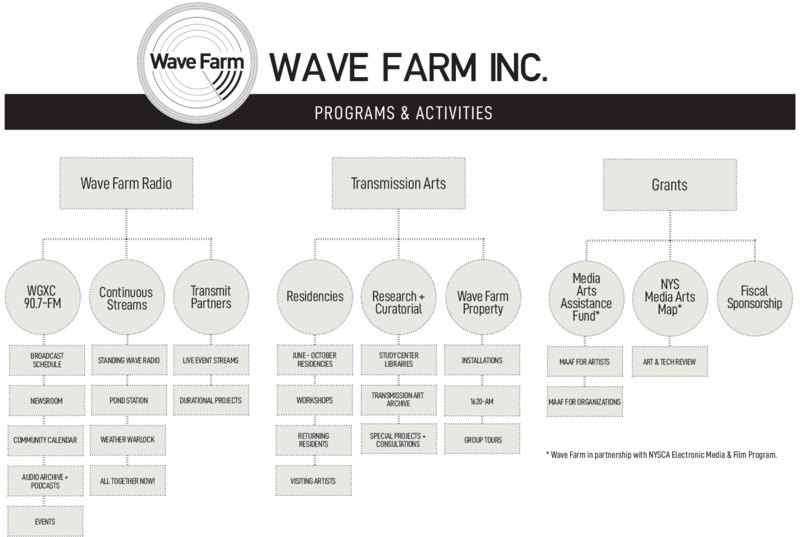 In June 2012, the Wave Farm Study Center opened its doors to the public, reigniting free103point9 programs, such as the Wave Farm Residency Program, the Transmission Arts Archive, and Wave Farm Radio that had become somewhat dormant while organizational resources were focused on launching WGXC. From 2013 to 2015, as part of an organization-wide strategic planning process, free103point9 began using Wave Farm as its organizational name and identity. And in 2016, Wave Farm's WGXC published A Manifesto for Participatory Radio, which articulates the station's key belief system: Community, Creative Use of the Airwaves; Hands-on, two-way radio. Wave Farm celebrated its 20th Anniversary year throughout 2017 with a series of very special events and live durational broadcasts including, Wave Farm Pirate Radio Reunion Cruise on Classic Harbor Line's Manhattan II yacht, March 7, 2017; Audio Buffet (For Pauline Oliveros), July 22, 2017 at Wave Farm; and Wave Farm 1997-2017: Twenty Performances for Twenty Years, October 21, 2017 at the Fridman Gallery in New York City. At the end of 2018, Wave Farm adopted a new WGXC station slogan, "Radio for Open Ears," in conjunction with changes to the 90.7-FM program schedule. 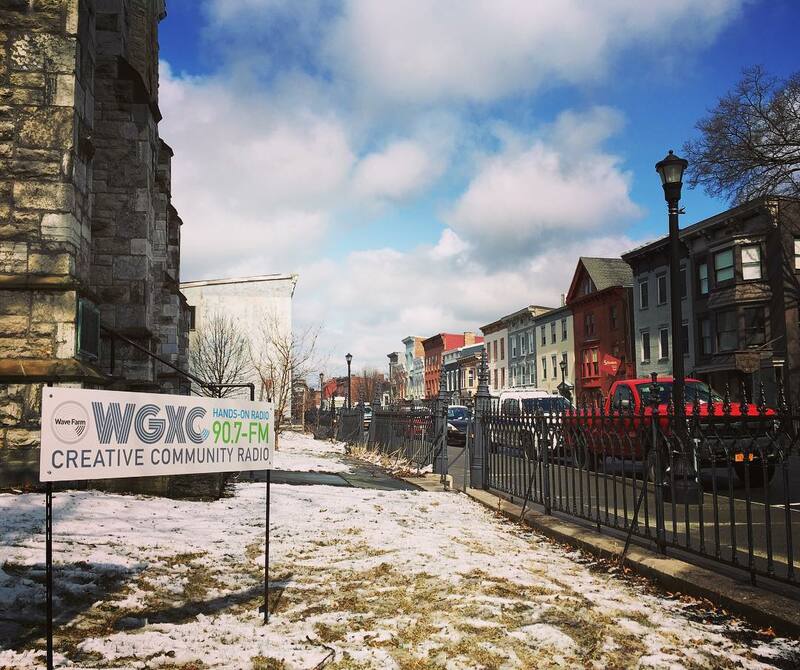 WGXC's new schedule commits increased daytime listening hours to sound art and experimental music. Local interview programs are brought to the foreground during expanded morning and afternoon drive time programs, and evening programming features live performance from near and far. Wave Farm programs are made possible, in part, by the New York State Council on the Arts with the support of Governor Andrew Cuomo and the New York State Legislature; the National Endowment for the Arts; The Andy Warhol Foundation for the Visual Arts; the Greene County Legislature through the County Initiative Program, administered in Greene County by the Greene County Council on the Arts; the Alexander and Marjorie Hover Foundation; the Foundation for Contemporary Arts; the T. Backer Fund; the Joseph Family Charitable Trust; and hundreds of other generous individual donors.